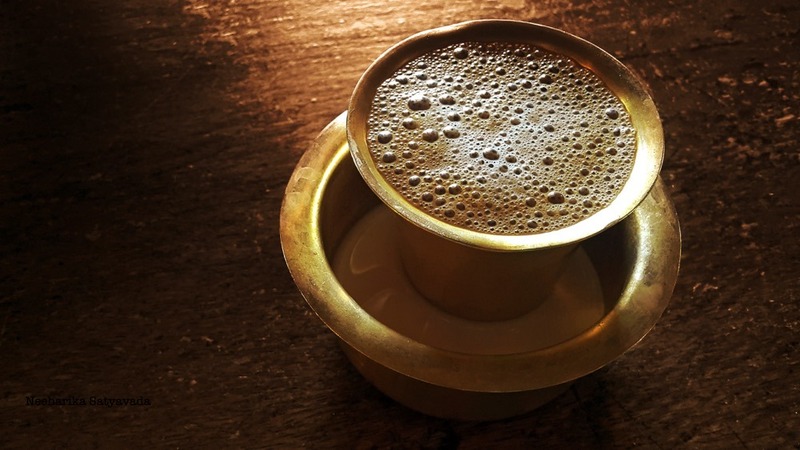 Who doesn’t love a South Indian Filter Coffee? Ask any South Indian who has grown up with the smell of a fresh brew signalling the start of every morning or a North Indian for who it is as much of a novelty as a Starbucks is to any urban Indian!! But, trust the Tamilians to add a dash of zest to our plain old filter-kaapi. Served in the traditional tumbler-davara, the fun lies in mixing the strong drip brew with the sweet boiled milk and sipping it with the delicious froth on top. So, along the NH67 from Trichy to Thanjavur when Karthik, our local driver on this trip suggested we stop to taste Kumbakonam‘s celebrated Filter Coffee, we were more than game. Stepping into Kumbakonam Iyer Kaapi, I was curious and there was that tiny flutter of excitement from expectation (which by the way doesn’t happen that often). From how promising this cafe looked on the outside, it definitely delivered on both how the coffee was and also on the ambience. Like the classic Remington occupying centre stage at a corner table wasn’t enough for me to fall in love with this place, it came with a map hand painted in tamil on the wall, antique furniture, vintage cameras & radios that recreate a rustic atmosphere for you while adeptly keeping out the wannabe-ness that usually comes with places trying so hard to be different. PS: I do make a mention of Karthik here because, it was thanks to him that we got to experience a couple more places than what was on our itinerary for Trichy which was in such stark contrast to the clumsy concierge at the Oberoi Udaivilas who along with the guide that they recommended were solely responsible for making our trip to Udaipur – right after – nothing short of a disaster! What a lovely place! And such quirky interiors!